Business | MiniatureGarden.com for Everything Gardening in Miniature! The Business of Gardening in Miniature. Interested in starting a business gardening in miniature? There are more than a few ways to begin, but only some of them will pay-off and others will be a complete waste of time, money and energy. 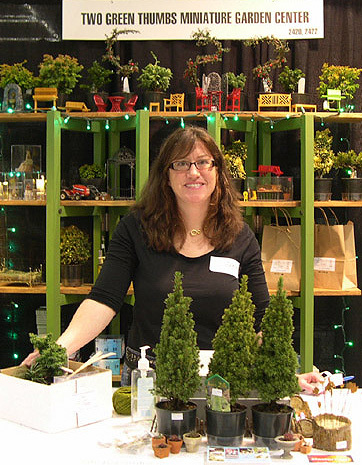 All the experience & insights that Janit has gained throughout the 18 years of selling miniature gardens, plants and accessories offline and online, will be gathered into the Miniature Garden Society. It’s a no-nonsense-what-works-and-what-doesn’t approach to getting your hobby into a business format that will pay. See more about the Society here. SAMPLE BUSINESS TIP: Beware of ‘business 2 business’ companies, they are the ones you need to look out for. There is no “magic bullet” to get where you want to go but there are plenty of people who will trick you into thinking that their company has all the answers. Do your research on the company/individual before you invest by getting personal referrals from outside the company, and take a good look at their portfolios too. If you don’t like their work they’ve done for others, you won’t like the work they’ll do for you. It doesn’t matter how nice the person is, how “experienced” they are, nor how many customers in your niche that they already have worked for. In this arena, you are the customer – be very picky. This is about your business, which is your dream. Don’t compromise. Don’t sell yourself short.